Serial: 00222 18 June 1945. (Commander FIRST Carrier Task Force, Pacific, -- Vice Admiral M.A. MITSCHER. U.S.S. Randolph, 15 May to 28 May, 1945). To: Commander in Chief, United States Fleet. Via: (1) Commander FIFTH Fleet. (2) Commander in Chief, U.S. Pacific Fleet. Subject: Report of Operations of Task Force FIFTY-EIGHT in Support of Landings at OKINAWA, 14 March through 28 May (East Longitude Dates), including Actions against KYUSHU, NANSI SHOTO, Japanese Fleet at Kure, the Yamato, and Operations in Direct Support of Landings at OKINAWA. Reference: (a) Com5thFlt Operation Plan 1-45. (b) CTF 58 Operation Order 2-45. Enclosure: (A) Calendar of Employment. (B) Changes in Organization and Chronological Record of Damages to and Movements of Individual Ships. (C) Task Force 58 Replacement Requirements for the period 18 March through 18 April, 1945. (D) Destruction of Yamato Task Force on 7 April 1945. (E) Logistics Report (TG 50.8 figures). (F) Task Force 58 Flight Schedules at KYUSHU. (G) Complement of Air Groups (CFCTFP Secret Ltr. Serial 00220 dated 31 May, 1945). (H) Diagram of Task Force 58 Air Defense Plan for OKINAWA. 1. During the period covered by this report Task Force FIFTY-EIGHT, under the tactical command of Vice Admiral MITSCHER, operated in support of the amphibious forces of the FIFTH Fleet, occupying and capturing OKINAWA and adjacent islands in accordance with Com5thFleet's Operation Plan 1-45. This support took the form of day and night strikes, sweep and search operations against KYUSHU, the neutralization of enemy airfields and facilities in AMAMI GUNTO and MINAMI DAITO, the supplying of day and night CAP and close air support to the occupation forces commencing 18 March, 1945, and still continuing as this report is written. Routine search operations by Task Force FIFTY-EIGHT were discontinued on 9 April, 1945. (In this report all times are minus 9 and all dates East Longitude). 2. This action report constitutes a general discussion of the Task Force employment and accomplishments and a framework into which should be fitted the more specific and detailed reports of the Task Group Commanders. Enclosure (A) is a day by day calendar of employment. Enclosure (B) shows the composition of the various Task Groups at different stages of the operation and the damage to ships of the Force. It should be noted that although the Task Force sortied from ULITHI on 14 March with four Task Groups, it was reduced by battle damage (Franklin, Wasp and Enterprise) on the 22nd of March to three Task Groups and remained at this strength (except for the period 8 to 17 April when Task Group 58.2 was reorganized) the remainder of the time. Commencing on 27 April, one Task Group was continuously at a rear base for a 10-day period of upkeep and repairs, leaving two Task Groups to furnish tactical and strategical support to the amphibious forces. 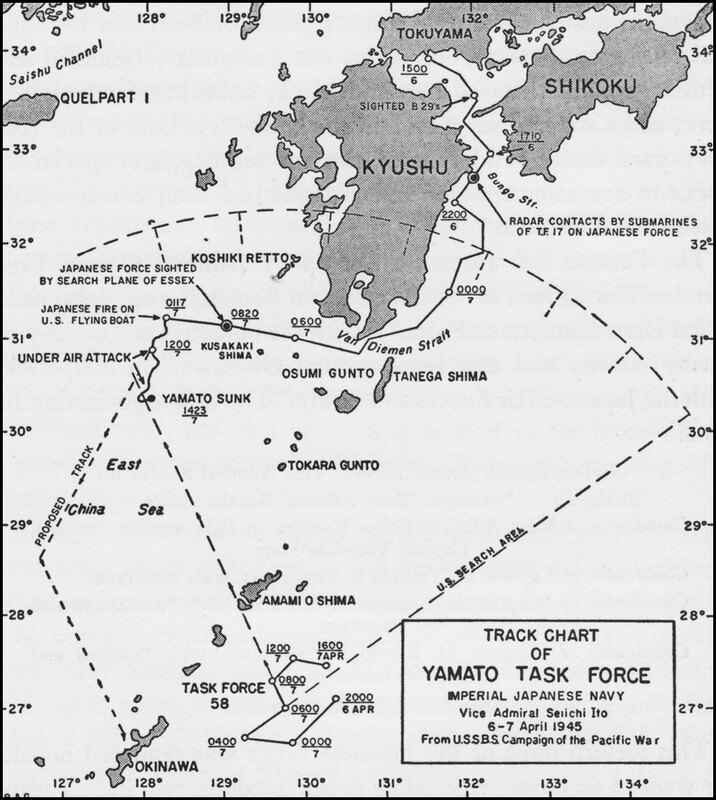 Beginning on 23 March, combat air patrol and air support missions were furnished to the amphibious forces with the exception of about five days when weather prevented, and five days in May (13th to 18th) when the two available Task Groups (58.1 and 58.3) attacked KYUSHU in force for two days and replenished for two days. This was the only period during which one or more Task Groups were not in the immediate vicinity of OKINAWA. The schedule of replenishment normally allowed Task Groups to refuel and replenish every fourth day. This meant that during the period 23 March to 28 April, an average of two Task Groups were supporting OKINAWA each day. From 28 April until 32 May, one Task Group was always in support and two Task Groups on two days out of every four. Due to the loss of the services of the Enterprise (19 March) the VFN complement of Each CV was increased from four to six night fighters. This enabled the Task Force to supply continuous night CAP over OKINAWA from 25 March until the return of the Enterprise on 7 April, as a unit of Task Group 58.2. The Enterprise was damaged again on 11 April and had to return to ULITHI for repairs. It is interesting to note that for two and one-half months the Task Force operated daily in a 60-mile square area East of OKINAWA, less than 350 miles from KYUSHU. This was necessitated by the restricted area available and the necessity for being able to cover AMAMI GUNTO airfields, intercept air raids before they reached OKINAWA and still furnish air support to ground forces. There was no other location from which all these things could be done. It is a degrading reflection on the enemy submarine service that they were unable to make us move or even threaten our ships during this time. 3. The following brief accounts are some of the highlights of Task Force FIFTY-EIGHT's accomplishments during the OKINAWA operations. No bogies worried the Force during daylight on the 17th of March. A scouting line of twelve destroyers was placed thirty miles ahead, normal to the Fleet Course; these destroyers split at dawn on the 18th into two groups and formed two radar patrol groups, one 30 miles North and one 30 miles to the West of the Task Force. A combat air patrol of at least eight fighters for each radar patrol group was provided. This CAP was controlled by the destroyers. Whenever an attack developed the CAP was increased to 16 VF. The first bogey was detected at 2145 on the night of 17-18 March and from then on the Force was shadowed continuously. Two of the shadowers were shot down by the Enterprise night fighters. Two submarine contacts were also attacked by the destroyer screen. At 0545 on the 18th of March, the first fighter sweeps and CAP were launched from a position approximately 100 miles to the East of the Southern tipi of KYUSHU. These sweeps consisted generally of about 32 fighters from each Task Group. The sweeps were followed three-quarters of an hour later by strikes from each Task Group of about 60 VT and VB escorted by approximately 40 fighters. The VF sweeps had as their objective the destruction of enemy aircraft, both in the air and on the ground. The VB/VT strikes were directed to destroy primary airfield installations. The air plan of attack for the various Task Groups is shown in enclosure (F). The Task Force Commander directives are contained in reference (b). As the air opposition over KYUSHU during the forenoon was of a minor nature and not many aircraft were seen, the afternoon strikes were ordered to attack targets further inland which originally had been planned to be attacked on 19 March. This proved to be a profitable move and 102 enemy aircraft were shot down by our sweep, strike, and search planes and about 275 additional aircraft were destroyed or damaged on the ground. Primary airfield installations suffered heavily--excellent photographs being taken of the damage incurred. over the force and attempting what in some cases may have been suicide attacks but were probably all well-pressed home glide bombing attacks; many aircraft were shot down by heavy and well directed gunfire, but nevertheless Yorktown and Enterprise were hit by bombs, and Intrepid suffered a near miss by a twin-engine plane shot down by gunfire. Damage to Yorktown was minor and the bomb that hit Enterprise failed to explode; consequently, all carriers were able to continue flight operations. It was a trying period, as little, if any, warning was being given by the radars in the Force, and t times the first indication of an aircraft approaching was visual sighting by the close screen. The picket destroyers were invaluable with their visual sightings. The CAP shot down a total of 12 aircraft and Task Force anti-aircraft fire splashed 21 more. During the morning of the 18th, photo reconnaissance by planes from Task Group 58.3 disclosed a large number of major fleet units in the Inland Sea. Commander Task Force 58 decided to attack these units the following day with the harbor installations at KURE and KOBE as alternate targets. Fighter sweeps against intervening airfields on SHIKOKU and Western HONSHU were to precede and follow these strikes. KURE - (Damaged) - 1 Yamato Class BB--slight damage. 1 Ise Class BB/CV--several bomb hits. KOBE - (Damaged) - 1 CV--hull hit by 3 500lb. bombs. 1 CVE--hit by 5 500lb. bombs--severely damaged. In addition pilots reported probably sinking 1 SS and damaging 1 CVE and 2 SS, and sinking and damaging a considerable number of merchant ships, coastal vessels and small craft at various locations in the Inland Sea. Shortly after the first sweep and strike had been launched an attack developed, mainly on Task Group 58.2, which was 20 miles to the Northward of the other groups. Franklin and Wasp were hit. Franklin was hit half way through launching her strike and burned fiercely; six enormous explosions were seen when the ship was below the horizon. Wasp, although hit by a bomb which exploded between her second and third decks, put out the usual fire and was able to work aircraft within an hour. Owing to a flooded boiler room her speed was reduced to 28 knots. All Task Groups then came under attack, the weather being perfect for the enemy--a thin layer of 7/10 clouds at 2500 feet. Radar again was unable to compete. At least six aircraft attacked Task Group 58.3, all coming in at cloud level and diving at an angle of 45 degrees; all six were blow to pieces, but they were near misses. It was impossible to say whether the aircraft were suicides or otherwise and, needless to say, carriers were invariably their targets. The AA gunnery was excellent. Perhaps gun crews were inclined to open fire well out of range but no one attempted to stop them as their fire was most comforting. During the afternoon of the 19th the Task Force retired, covering the Franklin and at the same time launching fighter sweeps against KYUSHU airfields in order to disorganize any proposed attack on the Force as it withdrew slowly to the Southward. The sweep was successful in destroying fair numbers of aircraft on the ground. The only attack on the Task Force that evening, by about eight planes, wsa intercepted 80 miles away and five aircraft were shot down, the others escaping to their bases. The total number of aircraft claimed for the day,k shot down in the air by AA and aircraft, was 97 planes with approximately 225 additional aircraft destroyed or damaged on the ground. No shadowing aircraft put in appearance during the night of 19-20 March. At dawn on the 20th, the Franklin and the majority of Task Group 58.2 were 40 miles to the North of the Task Force and about 160 miles from the nearest enemy base. At this time the Franklin was being towed by the Pittsburgh and making about 5 knots. Her rudder was jammed hard over and was causing trouble. After a moderately quiet day on the 20th, shadowers again put in their appearance and at about 1630, Task Group 58.2 was attacked by about 15 enemy aircraft which approached low and very fast and then split up for individual attacks. Seven planes were shot down by fighters and seven by ship's gunfire. Enterprise was hit by own forces' gunfire and a fire developed which put her out of action for flying operations, and destroyed 8 planes. The destroyer Halsey Powell, while clearing the side of the Hancock, was damaged by a plane which narrowly missed the Hancock. As a result of this hit Halsey Powell was able to make only ten knots, causing more delay in our retirement to the Southward. by this time had managed to work up to 15 knots under her own power and was gradually working to the Southward of the Task Force. More shadowers appeared at sunset, and the night fighters which were airborne were unable to intercept them owing to their radical maneuvers and intelligent use of window. At about 2300, an unsuccessful 8-plane torpedo attack on Task Groups 58.3 and 58.1 took place. Shadowing aircraft continued to report our position during the night, although three of them were shot down by AA fire. At 1400 on 21 March, a large group of aircraft were detected by radar 100 miles to the Northwest. Extra fighters were scrambled and altogether 150 fighters were airborne in a very short space of time. Twenty-four fighters from Task Group 38.1 intercepted 32 Bettys and about 16 single-engine fighters about 50 miles from the Force, and in a very short while all the Bettys and all of the fighters had been shot down for the loss of 2 of our own fighters. The Bettys were seen to be carrying one small plane each under the fuselage. These were subsequently identified as Baka Bombs. This was the first known appearance of the Baka. As the Task Force was only 100 miles from BORODINO Islands a sweep of 4 VFN was sent over MINAMI DAITO airfields. Only four aircraft were seen on the field and these together with a few small craft were heavily strafed. operations against OKINAWA. Ships were moving everywhere. The British Liaison Officer on the Staff of Commander Task Force 58, reported officially, "that it was during this first replenishment period that he became fully aware of the versatility, power and efficiency of the United States Pacific Fleet." Initial air operations against OKINAWA and adjacent islands, including KERAMA RETTO, commenced 9 days before the date of the main landing. These operations took the form of extensive bombing attacks of all known installations including coastal batteries and were designed to prepare the are for mine sweeping operations and the landing on KERAMA RETTO. In addition, complete photo reconnaissance coverage was accomplished and delivered to the amphibious commands just prior to their landings. On 23 March at 0028, an enemy submarine was rammed and sunk by the USS Haggard while operating as a unit of Task Group 58.4. On 24 March, the fast battleships carried out an effective bombardment of the Southeastern Demonstration Beaches on OKINAWA. Also on this day Task Group 58.1 destroyed an enemy convoy consisting of 3 medium AKs, 1 DE, 1 Chidori TB and 3 other escorts which were located 150 miles Northwest of OKINAWA. The operations of all forces involved proceeded smoothly and according to plan. Enemy air opposition was non-existent and it became increasingly apparent that our initial strike on KYUSHU facilities had interfered with enemy air operations to a greater extent than had been hoped for. the Force as a linking vessel between the Task Groups and the picket destroyers, was hit by a suicider and had to be detached from the Force. The radar picket group of destroyers again had a field day--one destroyer alone shooting down three suiciders while their CAP shot down six enemy aircraft. The Task Force fighter combat air patrols over OKINAWA, and fighter sweeps and patrols over the islands to the Northward, had a very hectic time and altogether between the two Task Groups 249 airborne planes were destroyed, of which Task Group 58.1 claimed 136 over OKINAWA, and Essex nearly broke the carrier record by her aircraft shooting down 65 aircraft in the course of the day. Our own losses in air combat totaled 2 for the day as against 236 for the enemy. During the night of 6-7 April, one of our submarines on patrol off BUNGO SUIDO Channel [the southeastern entrance to the Inland Sea--between Kyushu and Honshu--featured in Run Silent, Run Deep --HyperWar] reported an enemy surface force headed Southward. All Task Groups were ordered to concentrate to the Northeast of OKINAWA. Search aircraft, 40 VF in units of four, were launched at dawn, searching between 336 and 056 degrees to a depth of 325 miles and at 0822 an Essex search unit made the first enemy report of one battleships, probably Yamato Class, two cruisers and eight destroyers in position 31°-22'N, 129°-15'E., course 300°, speed 12 knots. (The contact report was expeditiously received via VHF using two link units at 100 and 200 miles). A tracking and covering force of 16 fighters were launched at 09156 and they were followed at 1000 by the strikes of Task Groups 58.1 and 58.3, and 45 minutes later by Task Group 58.4. The original intention was for all Task Groups to launch together, but Task Group 58.4 could not be ready in time. Hancock's air group (12 VT, 15 VB and 24 VF) was 15 minutes late on taking-off, failed to join up and subsequently did not find the enemy. (For plot of enemy track and attack, see enclosure (D)). All Avenger (VT) aircraft carried torpedoes, the Helldivers (VB) were armed with a mixed load of 1000-lb. SAP, GP, and two 250-lb. GP, and the fighter aircraft with a 500-lb. GP bomb as well as a long-range tank. The launching position was latitude 27°-10'N, longitude 129°-30'E, approximately a distance of 240 mils to the estimated position of the enemy fleet. A deathly silence ensued from the shadowing aircraft which was not broken until 1030, when the Force was reported to have altered course to the Northward, and shortly afterward a search aircraft from OKINAWA made contact and confirmed the enemy course. This plane shadowed the rest of the day and did an excellent job. On the whole, shadowing reports failed to ge through to the Task Force Commander after that, but as it turned out, the strike leaders were soon in touch with the shadowing aircraft, and the islands in the track of the strike made the navigation problem simple. Final homing was done on a SB2C radar (APS-4) which picked up the enemy force at a distance of 32 miles from 6000 feet. The enemy battle fleet was sighted in position 30°-34'N,m 128°-08'E, approximately 70 miles, 225 degrees from first sighting report. The weather was poor with 8/10 cloud cover at 3000 feet. The low ceiling and so many aircraft made the attack most difficult to coordinate. Anti-aircraft fire was heavy but inaccurate and a large number of both torpedo and bomb hits were claimed on the Yamato, the one cruiser and three destroyers by first two strike groups (58.1 and 58.3 in order). The strike group of Task Group 58.4 arrived to find the Yamato listing appreciably and hit her with many bombs and 6 torpedoes, 5 of them on the high side--the Yamato blew up. The CL (Agano Class) which was found dead in the water was hit by approximately four torpedoes and eight 1000-lb. bombs to help her on her way to the bottom. Out of the original force of one BB, one CL, and 8 destroyers, the Yamato, one CL, and four destroyers were sunk, one destroyer badly damaged (Terutsuki Class) and one left burning. Two destroyers were apparently not seriously damaged. Our own plane losses were light-- 4 VB, 3 VT and 3 VF. personnel losses were four pilots and eight aircrewmen, the rest being rescued. efficiency. Twenty-nine men were killed, about 35 missing and 71 wounded, but she was able to land her own aircraft on their return at 1630. Although she was able to operate planes in an emergency, it was necessary to detach the Hancock from the Force for repairs. The radar picket line CAP had its high day of the entire operation, shooting down 14 planes out of the total of 54 destroyed airborne during the day. A search followed by a sweep of 32 VF armed with bombs was launched the following day to finish the remnants of the Japanese force. The search and sweep went to 325 miles but failed to find them. One search Corsair located a downed pilot in his boat and remained airborne for seven and one-half hours. This is believed to be an all-time record for a Corsair with one 165 U.S. gallon drop tank, and demonstrates what can be done by a pilot who understands how to operate his engine economically. At dawn on 11 April, Task Force 58 (less TG 58.4 away replenishing), was concentrated to the Eastward of OKINAWA. All indications pointed to a busy day. Support missions at OKINAWA were abandoned, and all VT and VB aircraft were placed in the hangar and debombed and degassed. Combat air patrols of 24 VF were kept over each Task Group and 12 VF over the Radar Patrol Group (8 destroyers), 25 miles to the northeastward. OKINAWA was given a target CAP of 24 fighters to augment their own Corsairs--a hundred of which had been flown n a few days previously but were not yet entirely operational--and a further 24 were disposed over AMAMI and KIKAI, the islands approximately 100 miles to the Northward of our operating area. This large force of fighters was staggered in height with the object of giving defense in depth to both OKINAWA and the Task Force. More fighters were available in the carriers to be launched as the outer patrols of fighters became engaged. The weather was favorable to the enemy in the forenoon with low cloud cover, but broke and lifted, and by the time the attack commenced, cloud base was t 4000 feet with 5/10 coverage. with the gunnery officers in every ship of the Task Group, was of great value in passing out the necessary information, and certainly proved his worth in this action. The Japs were ingenious in their use of window, coming in singly, using cloud and the sun, coordinating their dives very ably and obviously aware of the deficiencies of present radar installations. Plenty of practice was had by all in countering the suicide type of attack--11 suiciders being shot down by ships' gunfire of Task Group 58.3 without a ship being hit, although damage was caused by near misses. The shooting was excellent--particularly impressive was the quick sighting and opening of fire and the rapid training and firing of Bunker Hill's five-inch turrets, controlled by Mk 51 directors. Nevertheless the suiciders once in their dive were persistent and took a lot of punishment before being deflected from their targets, and as there were about 9 misses within 100 yards of the bigger ships of the group, it is apparent that the problem of the suicider is not solved. The attacks continued sporadically for the remainder of the day, but fortunately were discontinued prior to dusk--the force being undisturbed during this period. The total bag for the day was 12 shot down by gunfire and 17 by fighters. Several ships were damaged during these attacks. Missouri in Task Group 58.4 was hit by a suicider but suffered no damage. Enterprise was near-missed by four suiciders which pierced some of her forward tanks, caused one of her shafts to vibrate excessively and damaged her power supply and radars. Essex had a forward fuel tank pierced and one radar put out of action. The destroyer Kidd was severly damaged by a direct suicide hit and 3 other destroyers suffered some damage from a bomb hit, suicide near miss and friendly five-inch AA respectively. Enterprise and the four destroyers had to return to ULITHI for repairs. That night the enemy returned to the attack with shadowers and torpedo aircraft which continued intermittently until 0200 on the 12th. During the cvourse of which 7 aircraft were shot down by ships' gunfire and 11 more by night fighters. The night attacks were mainly single or small groups of aircraft and were badly executed and presented little threat to a well-maneuvered Force. defense plan was the same as for the previous day and the CAP's at OKINAWA and over the islands to the Northward had a field day--for the loss of 6 of our own aircraft, Task Force 58 fighters shot down 151 enemy aircraft, and 3 were shot down by ships' AA fire. Only 1 suicider managed to penetrate into the main anchorage. The enemy however, thwarted of their main target, attacked the radar pickets around OKINAWA and one destroyer was badly damaged. The old battleships to the Southwest of OKINAWA were also attacked, the Tennessee and Idaho and 1 destroyer being damaged by suiciders. Task Force 58 was again under attack the night of 12 April, but no damage was caused and two enemy aircraft were shot down by AA fire, and [illegible] by VFN. On 14 April, Task Group 58.3 fueled while the other Task Groups provided air support for OKINAWA and fighter patrols to the North. During the afternoon the Force was attacked by several small groups of enemy aircraft, making their approach from variable altitudes. The destroyer picket line received the brunt of this attack and the destroyer Sigsbee was seriously damaged by suicide planes. A total of 50 enemy aircraft were shot down during the day by aircraft and an additional 12 planes were shot down by AA fire, of which 10 were credited to the Radar Patrol Group destroyers. At 1315, on 15 April, a special fighter sweep consisting of 125 fighters was launched to make attacks on airfields on KYUSHU. This attack was a complete surprise to the enemy and many planes of all types were found on the fields. Twenty-nine enemy aircraft were shot down, 51 were destroyed on the ground by burning, and it was estimated that 67 aircraft were probably destroyed or damaged by strafing and rockets. Ground installations were also strafed and bombed, causing many fires. Our losses were two planes to AA fire--both pilots were rescued by Dumbo. intense fires. During the early evening attacks continued by were not effective. The Task Force score for the day was 155 enemy planes shot down, two of which were destroyed by VFN, 14 more shot down by AA fire, 55 destroyed on the ground and 79 damaged on the ground. Our own plane losses for the day were 9 planes and 6 pilots. Of the nine planes lost, 7 were to enemy AA fire and 2 in air combat. An interesting feature of the day was the destruction of three enemy aircraft by the VF escorting the Dumbo rescue plane to KYUSHU. During the night of 16-17 April and continuing until noon on 17 April, the enemy continued his air attacks, but at a reduced scale. Four enemy aircraft were shot down by night fighters, 31 by the Task Force CAP, 5 by AA fire and 14 by Task Force 58 fighters over OKINAWA. Our aircraft loss in combat was 1 plane. The morning of 18 April was highlighted by the sinking of a Japanese submarine by destroyers of Task Group 58.4 and Task Group 58.1. At about 2330, on the night of 17 April, the Heermann (TG 58.4) had a surface contact that very shortly developed into a sound contact in Lat. 26-42W, Long. 130-38E, and immediately began depth charge attacks. The McCord was directed to assist and remained on the attack, and the Uhlmann (TG 58.4) joined temporarily but resumed her picket station duties after making two attacks. Commander Destroyer Squadron FORTY-SEVEN in the McCord led the attack, assisted by aircraft at dawn, until relieved at 1030 by the Mertz (TG 58.4) and Collett (TG 58.1). This relief was ordered at 0700 due to the fact that the McCord, and Uhlmann had expended most of their depth charges. During the early morning several traces of diesel oil appeared and underwater explosions were noted. After an attack at 1312, the contact disappeared, a large oil slick developed, and debris surfaced including material and wood with Japanese markings and pieces of flesh. Enemy air attacks on OKINAWA were resumed during the night of 3-4 May. Task Force 58 VFN shot down 4 planes, 3 of them credited to one night fighter pilot. The day air attacks were all concentrated on OKINAWA. Task Force 58 VF operating as patrols over the islands North of OKINAWA, and as combat air patrol over OKINAWA, shot down 98 enemy planes. Our own losses were 5 VF planes and 1 VF pilot. At dawn on 11 May, Task Groups 58.3 and 58.4 were operating about 90 miles East of OKINAWA. The Force had been shadowed most of the previous night. Enemy planes were known to be attacking OKINAWA. About 1000, the Bunker Hill was hit by two suiciders without any previous warning of any kind. Both planes dove out of low clouds at a steep angle. The resulting fires and damage were of a serious nature. The casualties, mainly through asphyxiation, were 352 killed, 52 missing in action and many more injured. About 300 men who were forced to jump overboard or were blown overboard, were picked up by destroyers. Commander Task Force 58 staff suffered the loss of 3 officers and 10 men. Commander Task Force 58 and a skeleton staff transferred to the USS Enterprise about 1500, 11 May. During the course of the day 69 enemy aircraft were shot down by the CAP, mostly in the vicinity of OKINAWA. Three enemy planes were shot down by our AA and 2 suiciders which crashed the Bunker Hill were destroyed. During the night of 12-13 May, Task Groups 58.1 and 58.3 proceeded North to attack KYUSHU airfields. The attack plan called for two full days and nights of sweeps, strikes and night hecklers. The primary targets for all attacks were airfields and air facilities. During the approach, night heckler planes and a dawn target CAP from the Enterprise did some very excellent work shooting down a total of 12 enemy planes, 3 in the vicinity of the Task Force and 9 over enemy territory. Although our approach and position were obviously known to the enemy, no attacks were experienced throughout the day of 13 May. Both Task Groups carried out full schedules against assigned target areas, amounting to a total of about 700 target sorties. During the night of 13-14 May, Enterprise planes successfully heckled all of KYUSHU and part of SHIKOKU. During the night 4 planes were destroyed by night fighters and 1 by AA. Task Force day attacks were resumed on KYUSHU at dawn on 14 May. At 0615, the Task Force was attacked by about 26 single-engine planes. Six were shot down by AA, 19 by CAP and at 0659, one suicider crashed into the Enterprise putting her out of operation. This attack was a nerve-racking experience lasting until 0830. It was estimated that the enemy planes had passed the Task Force well to the West at low altitude and they approached from the Southwest. By so doing they avoided our radar picket group to the Northwest of the Task Force. The attack was first picked up by radar at a distance of 25 miles. Fighters were immediately vectored out and the ensuing engagement required the utmost in fighter direction and fighter pilot performance. It is a great tribute to the fighter direction and the fighter pilots that they were able to destroy 19 planes under existing conditions with the enemy fighters and Judys individually ducking in and out of the clouds. The Zeke which managed to crash dive the Enterprise was subjected to very heavy AA fire from all ships in Task Group 58.3 but by some miracle was not destroyed although it was evident that the plane had been hit by 20 mm fire. In site of the above interruption, the sweeps and strikes were maintained on schedule throughout the remainder of the day. The Task Force retired at sunset. Because of the loss of service of the Enterprise, no offensive night operations could be conducted to cover our retirement. The results of these two days of offensive operations were a total of 72 airborne enemy planes destroyed, 16 of them at night, another 73 planes were destroyed on the ground and 167 probably destroyed or damaged on the ground. In addition, VB/VT and VFB bomber strikes destroyed and damaged hangars, ships, barracks and other installations, including several fuel dumps at the following enemy airfields and bases: KANOYA, SAEKI, OITA, NIYAKONOJO, TAMANA, KIKUCHI, ASHIYA, GANNOSHU, KOKUBU, USA, IZUMI, TACHIARAI CHIRAN, OMURA, HITOYOSHI, KOCHI AND MATSUYAMA WEST. KUMAMOTO aircraft factory was also bombed and about 30% of the roof area was destroyed or damaged; however photos taken indicated that the factory was probably inoperative. No previous indication of this possibility had been received form any source. Our own air losses for the two days were 14 planes, (11 to enemy AA) 10 pilots and 7 aircrewmen.